Ageless Secrets of Royal Jelly are in it composition. Royal Jelly also called bee milk is a special meal Queen Bee. Royal Jelly is rich in hormones, work to improve and rejuvenate the body's cells, brain, nerves and organs - Anti Depreciating cell agen Natural Effect. Efficacy and Royal Jelly Miracle remarkable for health. What is Royal Jelly? is a thick white liquid produced by bees as food young bee larvae and special food queen bee throughout her life. What is in Royal Jelly? Royal Jelly is rich in amino acids, hormones, natural B vitamins (B1, B2, B3, B5, B6, B12), Niacin, Biotin, panthotenat Acid, Folic Acid, Vitamin C. Minerals (nitrogen, phosphorus, sulfur, iron, manganese, nickel, cobalt, selenium, gold, chrome, rough bismuth Royal Jelly contains 12% protein, 14% carbohydrates and 5% lipid. Where Royal Jelly is produced? Royal Jelly is produced by young bees eat bee pollen and honey is then removed through the hypopharyngeal glands in the form of thick white fluid, located on both sides of the bee head and neck. Queen Bee drink Royal Jelly straight from the honey bee gland. 2. Menoupouse syndrome, impotent, infertility. 3. Cancer / chemotherapy effects. 4. Broken bones, brittle bones. 16. Bladder Infection / gall. Expert Opinions and Modern Medical World of the distinctive Royal Jelly? H.W. Schmidt, M.D. (German Medical Association) Royal Jelly to improve the lives and the power, slows the aging process (stay young), maintaining youthfulness, refresh the body and strengthen the brain. Prof. Prosperi (APIMONDIA 16) Report success in dealing with the development of children born premature, malnourished and suffering from various diseases only with Royal Jelly. Dr. O'Connel (U.S.): Royal Jelly managed to cure Parkinson's disease and Buerger. Prof. Galeazzi-Lisi. Cancer patients are recommended to eat Royal Jelly shows the power of life of patients can recover. How Raja Madu Madu Raja bee farm Harvest Royal Jelly? Preparing qualified bees fed with pollen and honey bee sufficient. Choosing a candidate egg to larva into cell2 ditempakant resembling a beehive. Young bees will fill cell2 have given larvae with royal jelly as food for 3 days. 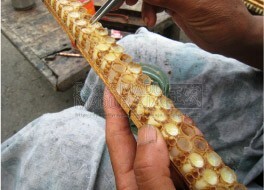 After 3 days the employee who has been trained to harvest royal jelly. So by raising larvae live inside the cell only royal jelly. Royal jelly has harvested immediately frozen at temperatures below -24 º C.Royal Jelly produced by Raja Madu Madu Raja Bee Farm very guarded quality, fressness and it pureness.